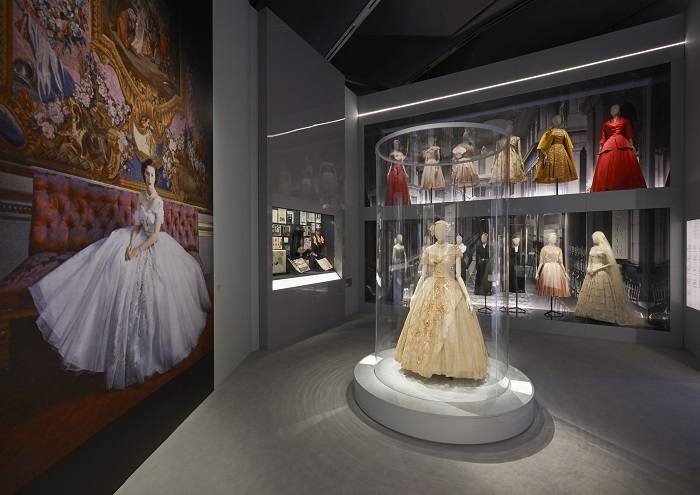 Dior is the focus of a new Victoria and Albert exhibition, Christian Dior: Designer of Dreams, and a smaller photography exhibition at Proud Galleries, The Dior Collection. What I didn’t know, but found out after these exhibitions, is that Christian Dior was massively fascinated by England. The V&A exhibition, just opened 30 January and the Proud Galleries open on 7 February, showcase the metamorphosis throughout his early years. He was only 21 years old when he arrived in England from Normandy, with the aim to polish his English. He has said in interviews that this moment in his young-adult life will forever be connected with the feeling of tasting freedom for the first time and falling for another place than home. “There is no other country in the world, besides my own, whose way of life I like so much. I love English traditions, English politeness, English architecture. I even love English cooking,” Christian Dior says, “I dote on Yorkshire pudding, mince pies, stuffed chicken, and above all I worship the English breakfast of tea, porridge, eggs and bacon.” He adores the quaintness, quirkiness and cosiness of English culture, the way women pulled off tweed as easily as ball gowns, and how they wear “flowing dresses, in subtle colours, which they have worn inimitably since the days of Gainsborough.” Besides doting on their way of dressing, he had a certain infatuation with anything to do with the British royals. Dior had a fierce passion for British craftsmanship; he was a loyal costumer at Savile Row and he bought his suits there for years. Besides that, he had a strong connection to London, and especially to the Savoy Hotel, where he hosted his first show in spring 1952. Over 4,000 people tried to get in while there were only 500 two-guinea tickets available. The ones that got in were in awe of the excess, the beading and taffeta, the full, silky skirts. His shows revitalized the glamour of the roaring Twenties, a time of plenty before the war. This was a time he will always remember fondly, albeit slightly melancholically as it had that Post War optimistic mind-set which can never be recreated. The V&A exhibition pays tribute to his many collaborations with British manufacturers including Dents, the glove maker, Lyle & Scott, the knitwear brand, Symington’s corsets and his use of British fabric companies such as Cumberland Mills. Dior admired and used London based textile designers Lida and Zika Ascher’s print. The Blue Bird silk sample applauded by Dior is displayed at V&A. Dior’s fascination with English artistry and skill was continued by John Galliano, the Dior designer with the most flamboyant style. He used the Wedgwood ceramics blue and white print on one of his ensembles displayed right now in London. In 1952 Dior established C.D. Models in London, which made his couture pieces available for the public by selling ready-to-wear versions at Harrods, Fortnum and Mason, Fenwicks, Galeries Lafayette Regent Street, Debenham and Freebody and Kendall Milne. Because of this clever move, the dream of wearing such a high-end brand became reality for many people. Even if they could only afford a hat or bracelet, the quality was still Dior-worthy and most importantly, it gave a little peak into the world of couture. A pair of Dent’s gloves is displayed by the V&A, “Few typists in the 1950’s could have afforded a Dior suit, but they could splash out on a pair of gloves with the covetable Christian Dior label.” Each season, Harrods held a week of shows for the new London collection. The first one in 1953 attracted 10,000 people, an enormous crowd for a couture house. England’s Royal Family has a special place in Dior’s heart. After his high profile show at the Savoy, the Queen organised a private viewing; Princess Margaret, Princess Marina and Princess Olga of Greece attended. Dior’s models were told they were going out for lunch, and were over the moon when the saw the royals waiting for them. An interesting detail is that his new collection was very controversial. The New Look pieces, ankle length, full skirts with a nipped waist, took a lot of fabric to make and were considered extremely indulgent and luscious in an austere and rationed Post War England. Carmel Snow, editor in chief of Harper’s Bazar was beguiled by the dresses and said, “It’s quite a revolution, dear Christian, your dresses have such a new look”, hence the name of the collection the New Look. King George V reportedly did not want the young princesses, Elizabeth and Margaret, to wear the richly pleated and fanciful silhouette in case it would be frowned upon by the public or press. In 2016, Dior returned to Blenheim Palace, after having hosted fashion-shows there in 1954 and 1958. Both were staged in aid of the Red Cross by Blenheim’s chatelaine, the Duchess of Marlborough, with Princess Margaret as the guest of honour. Over £9000 was raised that day. The palace, the baroque birthplace of Winston Churchill, held 1,600 guests during the event. Celebrities and nobility sat front row. “We all dressed up for it; it was an incredibly grand affair,” remembers Lady Rosemary, who sat near the celebrities of the day, including her sister-in-law the Marchioness of Blandford and Lady Astor’ (Telegraph). 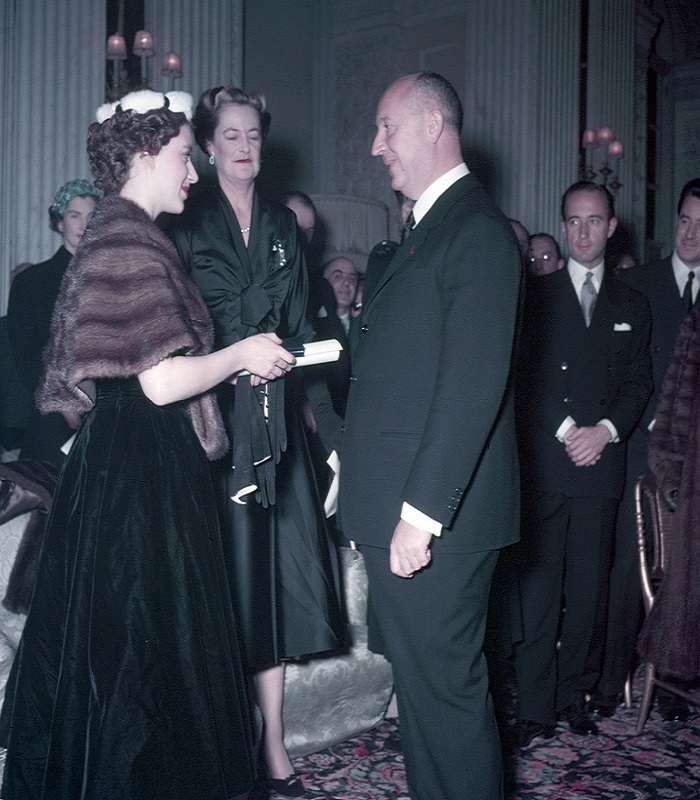 Princess Margaret gave Dior a massive boost in England by wearing and praising him frequently. Princess Margaret became a long-term costumer of Dior and he ended up designing Margaret’s white ball gown for her 21st-birthday in 1955. The gown, displayed at the V&A, is a variation on the Matinée poétique design for his Spring/Summer collection. It has subtle, but eye-catching golden embroidery, mother-of-pearl sequins, a tight buttoned bodice and large flowing skirt made of layers of silk. In its essence, it is the quintessential princess dress, perfect for Princess Margaret, the glamorous sister without the bonds of the crown. The garments she wore are displayed in the exhibition. Especially touching is the silk scarf Dior gave her, signed, to thank her for her support. Spanning from 1947 up to the present, the V&A exhibition traces the history and impact that Dior has had on the fashion industry, but also gives a rather private insight into Dior’s psyche. Personal pieces are on display, such as a portrait of Dior himself from the 1920s. “He’s portrayed as a young, colourful figure, not the grey suited one that comes to mind,” Cullen says. The portrait shows him how he was in his young years, sporting British trends in Paris and introducing English extravagance, such as bowler hats and brogues to his bohemian companions. Coinciding with the V&A exhibition is a smaller one at Proud Galleries. This photography exhibition focuses on Dior’s formative years and its evolution under Dior’s protégé Yves Saint Laurent. It is quite remarkable to think that Christian Dior was only head designer for about ten years. In these ten years, he became one of the most influential couturiers of the twentieth century, he revamped interest in haute couture after bleak war period next to putting pret-a-porter fashion on the map once more. And, not less important, he made the English royals fashionable again. The photographs give an intimate peak into the first two decades of his career. It includes trendy editorial Hollywood shoots to backstage studio snaps. Featured are four internationally renowned fashion photographers: Mark Shaw, Norman Parkinson, Jerry Schatzberg and Bert Stern. The Dior Collection explores Dior’s rich legacy after his death in 1957. 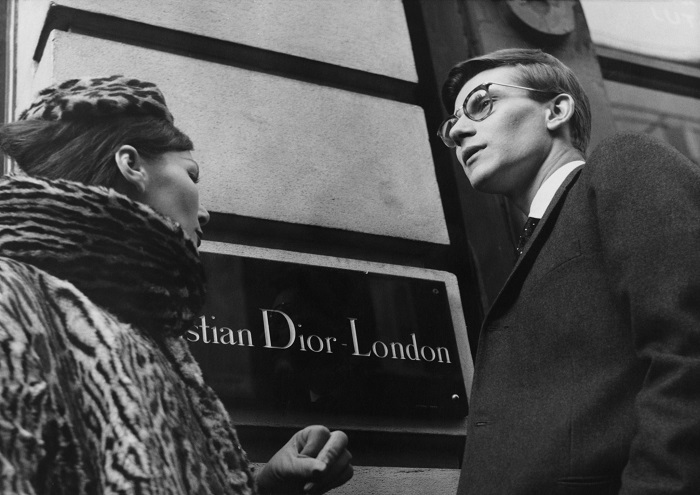 His protégé Yves Saint Laurent, nicknamed “The Little Prince of Fashion” continued his succes at the young age of 21. 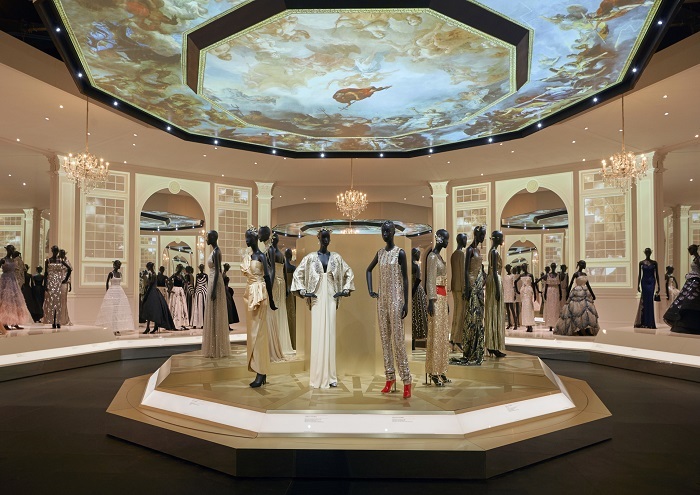 I applaud both these exhibitions for their stunning set up, but also their personal approach to telling the story of House of Dior. To get to know that he was a fervent Anglophile and to learn about his craving for travel, his adoration of the British royals and Princess Margaret and his love of gardening allows you to get somewhat closer to the mythical Monsieur Dior. 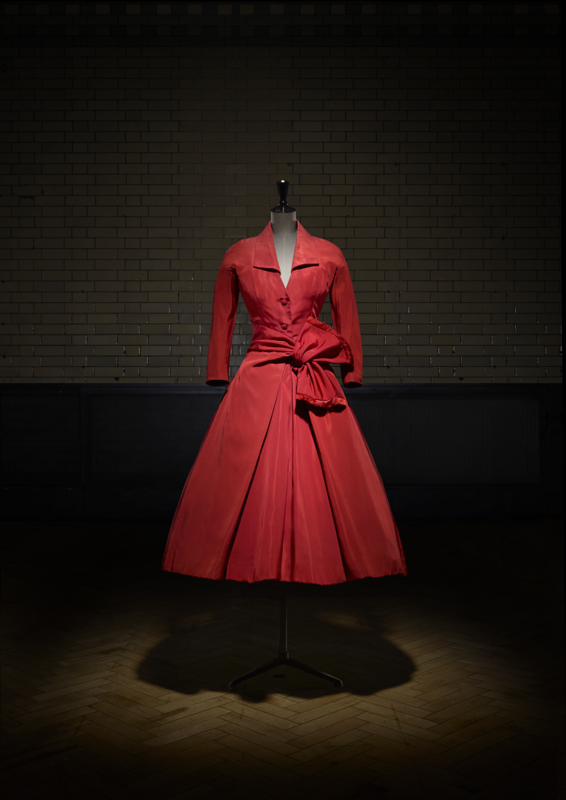 Christian Dior: Designer of Dreams runs from 2 February until 14 July 2019 at the Victoria and Albert Museum. The Dior Collection photography exhibition at Proud Galleries runs from 7 February until 7 April 2019.